We had about three days of cold weather before a random burst of heat and warmth, but those three days were enough time for me to break out some of the lovely winter recipes I’ve been hoarding. This, a Pork and Apple Casserole, definitely counts as a winter warmer. It also fits nicely into my mental category of “Really Quite Ridiculously Easy” recipes, as there is almost no actual cooking involved whatsoever. When I get home from a late lecture in Uni and it’s cold and mankey and all I really want is a hot shower, this is going to be perfect. Spend ten mintes cooking, bung it in the oven, go shower, come down to warm and gooey deliciousness. Excellent. Anyway. 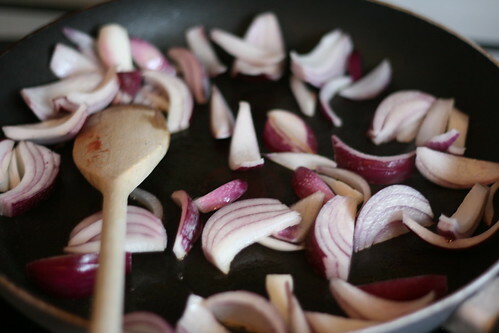 Spray the casserole dish/frying pan with Fry Light and put the red onions, cut into thick wedges, into it. Cook the onions over a high heat for five minutes, before putting either putting onto a plate (if you are using a casserole dish) or putting into the ovenproof dish. Cook the pork chops in the dish/frying pan and cook for three minutes on each side to brown. When they’re cooked, cut into slices (and put in the ovenproof dish in you’re using a frying pan). 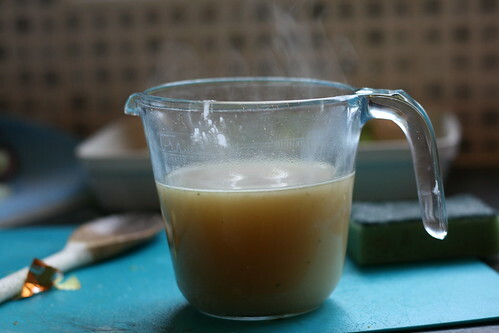 Whilst the onions and the pork chops are frying, thickly slice the apples and celery and mix a level tablespoon of cornflour with a tablespoon of water and stir into the stock. 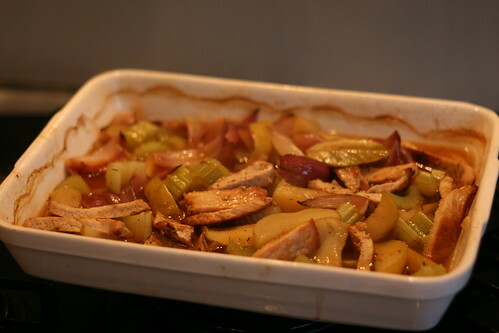 You then need to put the onions, celery, apples and pork slices into the casserole/ovenproof dish with a teaspoon of the chopped thyme, a bay leaf and some black pepper. Pour the stock over the top, cover with either the lid of the dish or some foil and put in the oven for 35-40 minutes. When you take it out of the oven, it should look something like this. And it will smell really, really good. Serve it either as it is or with some mixed vegetables. I cooked carrot, cauliflower and swede to give a mix of vegetables, which went well. Mmmmm. 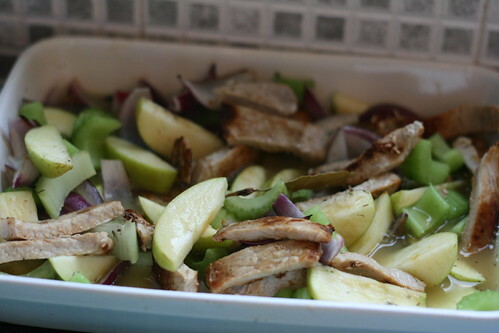 Pork and apples are a very, very good combination.